(Nanowerk Spotlight) As it is becoming clearer that one of the critical issues for developing functional nanomachines is the generation of energy required to power them, research into developing nanoscale energy sources has been picking up substantially. The energy to be fed into a nanogenerator is likely to be mechanical energy that is converted into electric energy that then will be used to power nanodevices without using a battery. Examples for mechanical energy are body movement or muscle stretching, vibration energy such as acoustic/ultrasonic waves, and hydraulic energy such as body fluid and blood flow (see: "Nanoscale power plants" and "Brushing up on nanogenerators"). With the emergence of nanotechnology and the use of nanomaterials, the field of piezoelectrics and nanopiezotronics has experienced a lot of new and interesting research efforts – for instance the recycling of environmental energy waste into hydrogen fuel that we reported recently. Generally, the advantage of piezoelectric nanodevices is that electrical energy can be generated by a variety of external stimuli resulting in a wireless, self-powered system. In previous work, researchers in Korea already demonstrated that transparent flexible (TF) nanogenerators with piezoelectric zinc oxide nanorods can be driven directly by pushing or bending the nanogenerator itself ("Mechanically Powered Transparent Flexible Charge-Generating Nanodevices with Piezoelectric ZnO Nanorods"). "Such transparent and flexible nanogenerators have garnered a great deal of attention because of the potential they present for new types of energy harvesting technology, such as nanogenerator-equipped flags that are charged by wind, or nanogenerator-embedded touch screens, in which a touching action is used for operating the display as well as self-charging," Sang-Woo Kim tells Nanowerk. "Furthermore, these devices can lead to new applications such as deformable mobile electronics or tactile skin sensors that can simultaneously detect position and pressure. However, since the TF nanogenerators are designed using indium tin oxide (ITO) electrodes to create a transparent device, the ITO-based nanogenerators have limited flexibility due to the ceramic structure of the ITO, and defects can easily be introduced if the device is overflexed." In new work, Kim, a professor in the School of Advanced Materials Science & Engineering at Sungkyunkwan University and Jae-Young Choi, a senior researcher at Samsung Advanced Institute of Technology (SAIT), together with collaborators from Sungkyunkwan University, SAIT and Kumoh National Institute of Technology, have demonstrated the first use of chemical vapor deposition (CVD)-grown large-scale graphene sheets as transparent electrodes for fully transparent and flexible nanogenerators. The team has published their findings in a paper published in the April 7, 2010 online edition of Advanced Materials ("Fully Rollable Transparent Nanogenerators Based on Graphene Electrodes"). In their technique, they prepared large graphene sheets using CVD on a nickel-coated silicon dioxide wafer (a technique based on the previous work: "Large-scale pattern growth of graphene films for stretchable transparent electrodes"). These graphene sheets were used as the platform for the growth of zinc oxide nanorods, which are synthesized at 95 °C using the aqueous solution method, resulting in vertically well-aligned zinc oxide nanorods on graphene. A graphene-based nanogenerator can then be completed by integrating the 3D heterogeneous nanostructure with another graphene sheet as a top electrode. By replacing the brittle ITO electrodes with graphene – and its promising mechanical durability – the team was able to realize rollable and transparent, fully graphene-based nanogenerators. "It is also worth emphasizing that we successfully fabricated a heterogeneous 3D nanostructure consisting of 1D zinc oxide nanorods grown epitaxially on a 2D graphene electrode with no damage using low-temperature wet chemistry on plastic substrates" says Kim. "To our knowledge, no one has reported zinc oxide growth on graphene electrodes before. Therefore, our result can be considered as the first usage of 3D heterostructures composed of zinc oxide nanorods and graphene." The Korean team points out that graphene-based RT nanogenerators are suitable for futuristic device applications such as flexible self-powered touch sensors, wearable artificial skins, fully rollable display mobile devices, and battery supplements for wearable cellular phones. Firstly, the transparent property of the power generator can make a big impact on the size and shape of various electronic gadgets since transparent elements can be embedded anywhere in the device. For example, a transparent power generator can be integrated into the display of a cell phone, thus enabling a significant reduction in size of the cell phone. The main impact of this work, though, is for the area of flexible electronics. "Even though most elements in flexible electronics can provide the flexibility, if the power generator is not flexible then a fully flexible electronic device cannot be achieved" explains Kim. "We had previously developed ITO-based nanogenerators but the mechanical durability of the device was a major weak point since ITO is brittle. With graphene-based nanogenerators we are able to overcome the durability issues of ITO-based devices." Nevertheless, there still are challenges that the research team is working on. "In a nanogenerator, Schottky contact formation between the top electrode and the zinc oxide nanorods is very important to enhance the output performance of the device" says Kim. 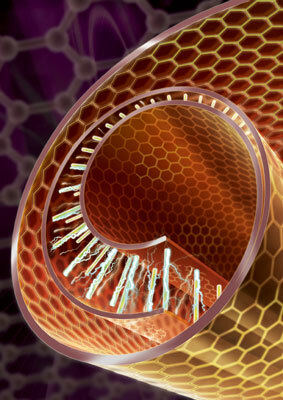 "Our current graphene electrode is only providing a weak Schottky contact. However, we can improve the output power level of our graphene-based nanogenerators via controlling the work function of the graphene electrode by a doping process." Another problem can arise from the top electrode. Depending on the morphology of the top electrode, the output performance can vary significantly since the contact probability of zinc oxide nanorods to the top electrode is not uniform. "Actually" says Kim, "we assume that only about 1/100 or 1/1000 of zinc oxide nanorods are involved in the electrical energy generation since the length of zinc oxide nanorods is not uniform at this present stage and many of them don't make contact with the electrode. We are working on this issue."